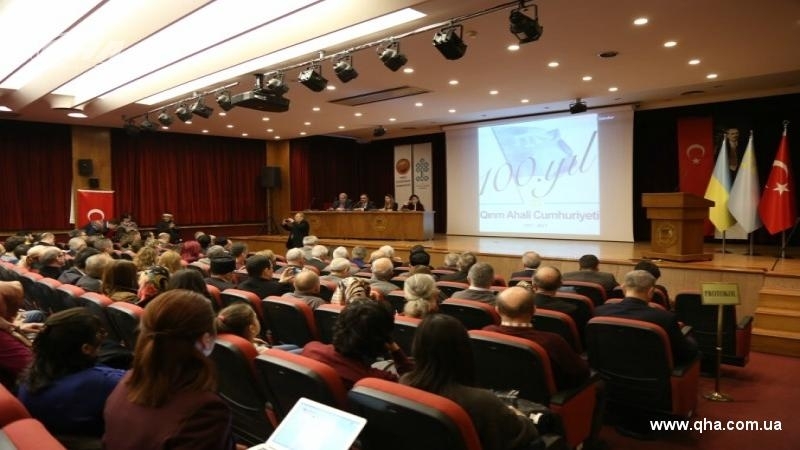 December 16, the National Library of Ankara hosted a panel discussion entitled "100th anniversary of the Qurultay of the Crimean Tatar people", organized by the Crimean Tatar Association of Culture and Mutual Aid of Turkey. The moderator of the panel was Hakan Kırımlı, Doctor of Historical Sciences, a Professor of the Turkish Bilkent University. The discussion was attended by People's Deputy of Ukraine, Chairman of Mejlis of Crimean Tatar people Refat Chubarov, First Deputy Minister of Information Policy of Ukraine Emine Dzhaparova, Editor in Chief of Ukrainian Pravda Sevgil Musayeva. In his speech, the Head of the Crimean Tatar Association of Culture and Mutual Aid, Mükremin Şahin recalled that the week before a number of events dedicated to the 100th anniversary of the First Qurultay of the Crimean Tatar people was held in Kyiv. “Today in the National Library of Ankara we are holding a closing event in honor of the 100th anniversary of the First Qurultay of the Crimean Tatar people and the creation of the Crimean People's Republic ... This struggle was supported for a hundred years by the will and aspiration of the people. These hundred years are known all over the world. Today we will consider the historical process of this event and consider the current situation in the Crimea," Mükremin Şahin said. The Doctor of historical sciences Hakan Kırımlı noted that the history of the Crimean Tatars has numerous victories and defeats. “However, the biggest victory is the one we celebrate today - the 100th anniversary of the First Qurultay of the Crimean Tatar people. The Qurultay of the Crimean Tatar people is a gift to all mankind. In 1938, on the orders of Stalin, many of our people were killed. There were many different peoples in the Soviet Union, but the Crimean Tatars are not like any of them," he said. According to him, the Crimean Tatars demonstrated to the whole world that people can fight for their rights without resorting to violence. “Regimes in which the Crimean Tatars lived are the ones which the whole world regards with fear. Crimean Tatars survived during the reign of Stalin, Lenin and those who seemed to be the pinnacle of world’s persecution. Now the Crimean Tatars live under the ugly repressive regime of Putin. The Crimean Tatars, despite these notorious regimes, continued to exist and retained their identity, without deviating from their belief in democracy, their belief in nonviolent struggle and respect for others. This is their great victory. The Crimean Tatars took the upper hand over the Russian empire, the Soviet regime and will definitely overcome the Putin’s regime," Hakan Kırımlı said.